John Sipher spent 28 years with the US National Clandestine Service. 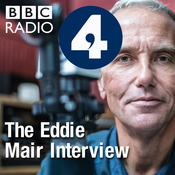 Mr Sipher spoke to Eddie Mair about his life undercover, why he's kept a brick from Osama Bin Laden's house, torture, and the Sergei Skripal poisoning. Artificial intelligence is already a big part of our lives, whether or not we are aware of it, and it will only become more significant. But could it ever help us with our most tender human emotions, like when we are grieving? Eugenia Kuyda is a tech entrepreneur and when her friend Roman Mazurenko died suddenly, Eugenia used machine conversation to bring him back to life. She told Eddie Mair about the app she created to do this called Replika, which describes itself as an artificial intelligence friend that's always there for you. (Photo: Roman Mazurenko and Eugenia Kuyda Credit:Eugenia Kuyda) .